This week on Raw, which I reviewed in detail here, World Wrestling Entertainment officially announced when and how they will crown their new Women’s Tag Team Champions. The announcement took place during Alexa Bliss’ “Moment of Bliss” segment where she stood on the stage with the new titles that you can see above and WWE.com posted a photo gallery of the titles as well. Two teams will start the bout while the remaining four duos remain enclosed in pods. At specified intervals, a pod will open at random, enabling a new team to enter the match. This will continue until all six pairs have joined the bout. If one member of a team gets eliminated at any time via pinfall or submission, both members of the team are eliminated and must leave the contest. 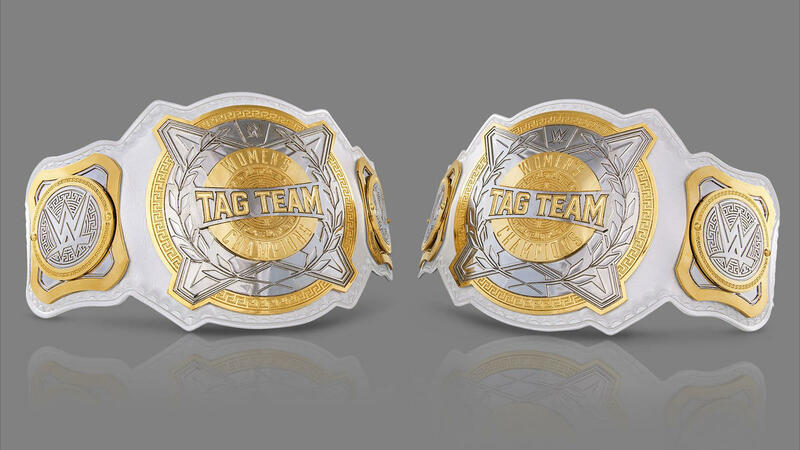 The last tag team standing will be declared the winner and the first-ever Women’s Tag Teams Champions. As we have stated in the past, WWE had Women’s Tag Team Champions in the past going back in the mid-1980s, but they are determined to ignore that and say that these are the “first-ever Women’s Tag Team Champions” in company history. What we also don’t know is if the Women’s Tag Team Champions will be on both Raw and Smackdown or if they will be brand exclusive. I guess what they could do is say if it’s a Raw team that wins it then Smackdown would get Women’s Tag Team Titles at another time. I don’t know if that’s the case, but it’s possible. TJR Thoughts: Now that we know how, the question becomes, who will it be? If it was up to me, Sasha Banks and Bayley are the best choice. I think putting it on them as a popular babyface tag team is the right call. There are other heel duos that would be fine like The Iiconics (Royce and Kay) or Mandy/Sonya on Smackdown, but I like the idea of Banks and Bayley as the first champions. Another possibility is the Bella Twins to return to WWE as the first champions since they worked together for so long as a duo. I wouldn’t do it, but WWE might go that way considering they produce two reality shows starring the Bellas. I’d go with Banks/Bayley as the winners. On a final note, I think the titles look fine. Better than that damn butterfly Divas Title. That was the worst.